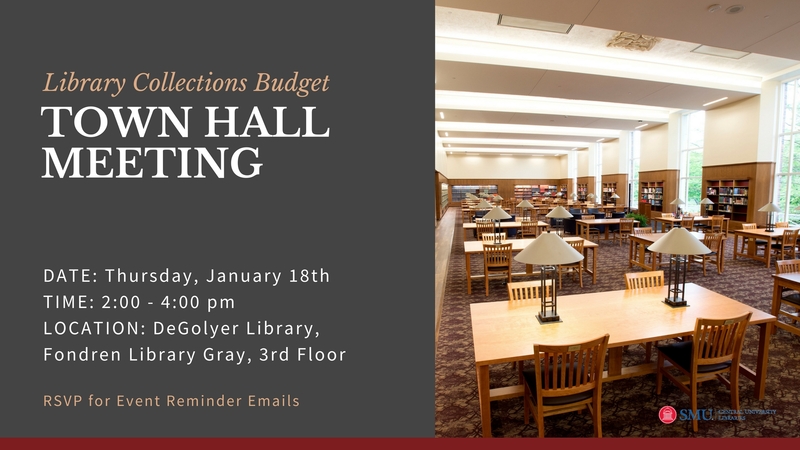 SMU Libraries collection development staff will hold a Library Collections Budget Town Hall meeting on Thursday, January 18th from 2-4 pm in DeGolyer Library, room 309. Collections staff will present information about the library’s budget and the cost of current subscriptions. We will also answer questions from faculty and other interested campus community members. DeGolyer Library is located on the 3rd floor of Fondren Library. Use the Gray Elevator located next to the IT Help Desk on the first floor.